In the Philippines, the Malampaya Sound is known for its ecological diversity, ranging from coral reefs to sea grasses to mangroves and lowland forests. 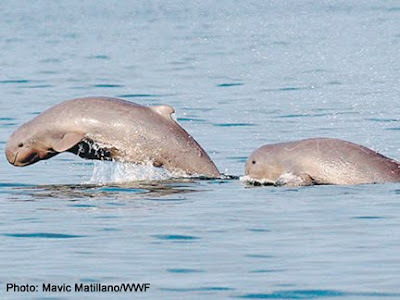 It is also home to one of the most endangered species of dolphin: the Irrawaddy dolphin. The number of dolphin in the sound has dropped from 79 in 2001 to 42 and scientists believe that if the number dips below 40, the Irrawaddy dolphin population in the sound will collapse. The Irrawaddy dolphin is a rather cute looking creature; a bit like a small beluga whale with a similar head shape and light grey in color. There are only about 6,000 Irrawaddy dolphins worldwide and it has been listed as "critically endangered" by the IUCN. Because of the Malampaya Sound's biodiversity, commercial and local fisherman have been attracted to the area and the sound is showing the impact of overfishing. No more so than with the plight of the Irrawaddy dolphin which is not commercially sought after but does become ensnared in the longline nets and, being then unable to reach the surface, drowns. However, there could very well be a positive future for the Irrawaddy dolphin if the indigenous Tagbanua people have anything to say about it. Representatives of the World Wildlife Fund (WWF) who have been monitoring the situation and working with local Philippine officials, say that the Tagbanua tribe have both a cultural history that supports protecting the dolphin and employ fishing techniques that could allow the Irrawaddy dolphin's numbers to return. The cultural position forms the background for their approach to fishing. The Tagbanua fishermen use specific moon and tide schedules and selective harvesting, regardless of market demands, to avoid overfishing and wasted bycatch (which is the category in which the Irrawaddy dolphin finds itself). According to the Philippine's Inquirer News, "WWF officials said the most important thing to do right now was to change the fishing practices of the coastal communities there. The group and [WWF author Raoul] Cola pointed to the Tagbanua fishing practices as a model of sustainable practice." “Based on the principle of the interconnection, not only of ecosystems but also of the natural, social and spiritual worlds, these strategies demonstrate that the world view of the users molds their environment and defines the prospect of its sustainability,” said Cola. The WWF is working with several Philippine agencies to implement commercial fishery management strategies based on the techniques employed by the Tagbanuas. The WWF is working hard to address funding issues, but they are encouraged by that fact that an indigenous Philippine tribe can serve as a model for many local coastal areas, rather than some outside group of "foreigners" imposing their beliefs on local fishermen. The Irrawaddy dolphin, like other dolphins, is an important apex predator and vital to maintaining a healthy biodiversity in the Malampaya Sound. Let's hope that local wisdom and responsible fishing techniques can spread to ensure the dolphin's future.